Have you ever been standing in front of a fishing hole and wondered how many insect parts you have left? Did you really want to open your inventory and find your insect parts to find out? Me neither. Introducing Bait Counter! When your reticle is hovering over a fishing hole, Bait Counter displays the number of currently selected bait next to the bait's name. That's it. Thanks to Garkin for help with the localization system for version 1.1! - Changed the way the label is modified. - API bump 100018: ESO 2.7 'Homestead' ready. - API bump 100017: ESO 2.6 'One Tamriel' ready. - Compatible with Update 7. 1.4.3: Compatible with Update 6. 1.4.2: Compatible with Update 5. 1.4.1: Compatible with Update 4. 1.4: Compatible with Update 3. Be patient. 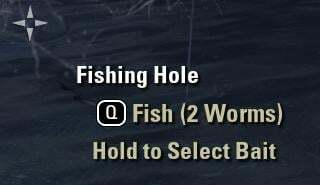 This will be different with "Wolfhunter" update for Fisherman. Last edited by votan : 07/29/18 at 01:11 AM. Is it possible to add a small panel on the UI with a list how many baits i got, each time i forgot before heading out to fish, if i even got baits left. Only to run back to guild stores in town. hmmmm. And how should the addon know, that you want to go out for fishing so it does not cluttering the UI all the time? If you have to activate it with a keybind, you remembered to check it already. You may check for some info bar addons, which perhaps doing this. Last edited by digibluez : 07/06/17 at 01:04 PM. I have just changed bait name to icons. -- over a fishing hole with that bait selected. if oldText == GetString(SI_GAMECAMERAACTIONTYPE17) then return end -- test to see if we're already fishing and should be prompting to "Reel In"
Last edited by Garkin : 07/21/14 at 09:11 PM. Thank you for the plug! I'm a big fan of modularity of plug-ins. If I only want one feature, I should be able to download only that feature, right? "GUIs are tough. Let's go wumpus hunting."